With New Year just around the corner, I think we are all waiting to take resolutions relating to health and fitness. I know I am! As mentioned in one of the earlier posts, I have already started to make some changes in the food area and have been getting some positive results. I did slip quite a bit and saw the consequences of that too. So I clearly know what works for me and what restricts my progress. Sugar (read it as cookies, cakes etc) is my weakness. I was able to go without sugar (without bread, cereal and store bought processed food but excluding fruits) for about 2 weeks when we didn’t have anything at home, but when there was something in the cookie jar or in the fridge I couldn’t resist it. I started with a bite, then a couple and then gobbled a few. The culprit: I baked a LOT because it’s the holidays (my son had to take cookies to school with him) and I also got an order to bake cupcakes for a party. Grains (including whole grains) is as addictive as sugar. The other day I made a delicious sambar and I couldn’t control myself from eating sambar rice for the third time. Carbs from grains weren’t helping me at any level. I was feeling sleepy, bloated and tired. Not being prepared resulted in bingeing. The lesson learned was to have some healthy snacks around like nuts, baby carrots, cheese, apple etc. But do not go overboard with dried fruits because it is sugar again and a lot of it from even a tiny portion. Menu planning is key whether you are on a diet or not. (I really don’t like using the “d” word because eating right should not be just for a period when you want to lose weight. It should become one’s routine/lifestyle). When I didn’t plan ahead what I was going to cook, the easiest choice was to make some upma or pongal, which is nothing but a load of carbs which doesn’t do any good. Soups and salads are my friends. I was getting a truckload (literally) of vegetables in, which is not otherwise possible. Salad doesn’t have to mean the usual raw lettuce, cucumber, tomato, carrot kind of stuff. 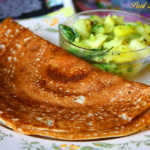 Even our humble South Indian dry curry is a great choice. Just make sure that you don’t overcook the vegetables and you have got yourself a good steamed salad, seasoned with amazing spices like cumin, coriander, hing, chilies; turmeric for the anti-oxidants, good fat from grated coconut and coconut oil used for tempering. If you have been led to believe that coconut and coconut oil is as bad as poison then you have to read this. Drinking plenty of water and getting good sleep is as important as eating right, if not even more. I have read and heard about this over a million times, but didn’t realize it’s effect until I practiced it myself. With the above observations in mind, I sincerely hope to follow it through and be able to look back in pride at what I would have achieved by the time it is December 2012. Now tell me what’s your resolution and how you are going to make it possible. Talking about soups and preparing it right from scratch, how about starting it with a good, flavorful homemade vegetable broth? 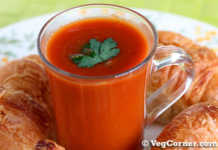 Is vegetable broth absolutely necessary to prepare soups? You can choose to prepare soups with or without vegetable broth, but I have to agree that vegetable broth gives the soup an enhanced taste and flavor. 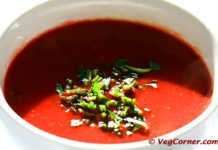 It is especially very good in soups which highlight a single vegetable. For instance a tomato soup, mushroom soup, broccoli soup etc, where you don’t have too many ingredients going in. 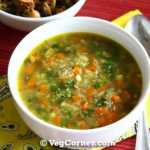 If you are preparing a medley of vegetable soup, with herbs and seasonings, plain water should be fine because you are going to get the essence of all those vegetables and herbs in the soup itself. 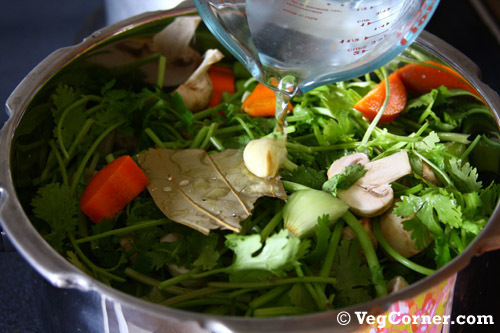 Have you noticed that vegetable broth is not as easily available as chicken stock or beef stock? So you can forget about spotting a low sodium vegetable broth. The solution is preparing it yourself at home. 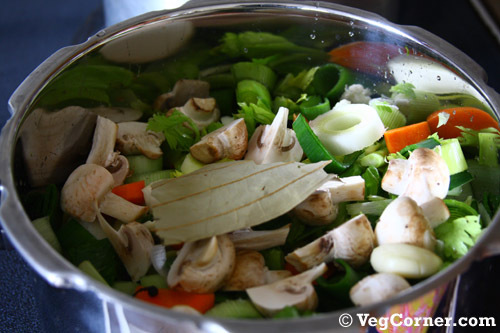 There is nothing easier than preparing vegetable broth at home. If you know to cut vegetables and boil water, you should be able to make your own “no sodium” vegetable broth. You may notice that I’m using broth for vegetable and stock for chicken and beef. So are you wondering if stock and broth are the same? It is and it is not. There is a whole lot of long discussion going on this topic and after reading a couple of articles I’m finally going by my favorite food network star Alton Brown’s theory because it is pretty simple to understand and that’s his specialty. So the difference between a broth and a stock is that a broth is made from meat or vegetables, but a stock is made from bones. The idea is that a stock is always jam-packed with collagen, whereas a broth is just some nicely-flavored liquid. So in that context, I’m going with vegetable broth. But if you are in a mood to know more about this in detail, read this and I’m pretty sure that after reading it completely you are going to agree with Alton Brown and me. There is no hard and fast rule about the choice of vegetables to make the broth but onions, celery, and carrots make a good flavorful base. Then you can round it off by adding anything else you have in the refrigerator. The choice is limitless, leeks, mushrooms, cauliflower, broccoli, potatoes, tomatoes etc. You could also enhance the flavor, even more, adding your favorite herbs. So this is simply a base recipe for homemade vegetable broth. 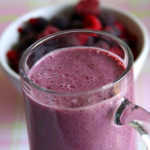 Feel free to add or omit any ingredient to suit your taste. 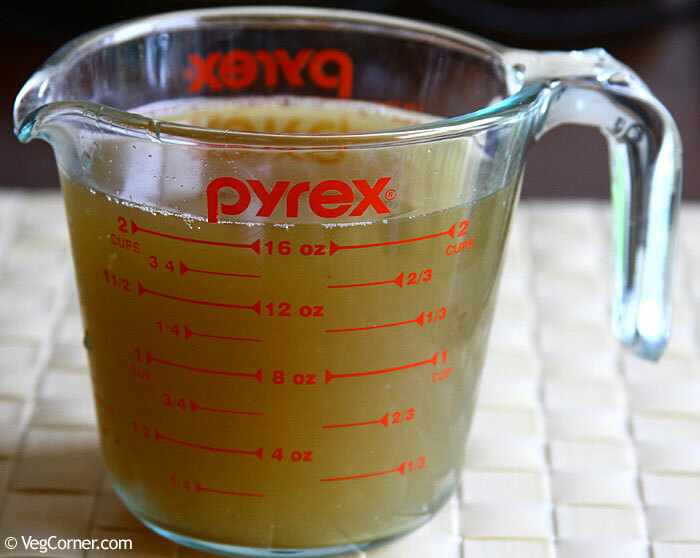 A simple recipe to make flavorful vegetable broth at home. It’s easy to make, cheaper and healthier than the canned broth you buy from the store. Thoroughly clean the vegetables, chop them roughly and put it in a big stock pot or a wide vessel to hold the vegetables as well as water. To remove the skin or not is your choice. But make sure to scrub the dirt off if you are not peeling. 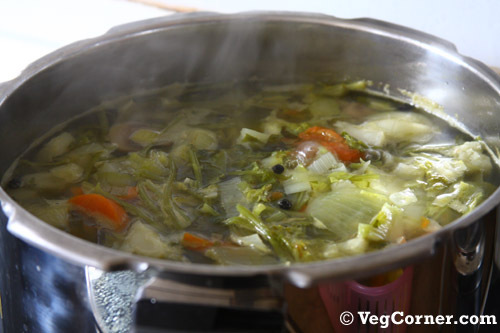 Cover the vegetables with enough water; set the pot on medium-high heat and bring it to a boil. Once it starts to bubble, turn down the heat a little bit. Cook for about an hour or so. I cooked mine for 2 hours. Again there is no standard time for this, but a minimum of 1 hour is needed for all the flavors to blend in. Since I used a lot of vegetables I extended the cook time by another hour. 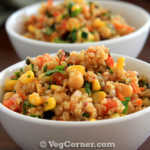 Remove the vegetables using a slotten spoon and filter the broth using a cheesecloth or a fine-mesh sieve or colander. This broth keeps good for about 3 days in the refrigerator and for about 2 months in a freezer or that’s what I’m reading everywhere. I haven’t tested to see what happens to the frozen broth after 2 months. If using leeks, make sure to remove each green stalk separately and thoroughly wipe off the dirt on the insides. Many Internet sources for homemade vegetable broth recipe suggests to throw in the leftover vegetables you have at the end of the week to prepare the broth. But I suggest the opposite. Start with fresh veggies for a flavorful stock. What I do is, I do the grocery shopping for the week on Saturdays. Once I come home I clean up the veggies like cutting the broccoli and cauliflower into bite size florets and retain the tough stalks for the broth. I cut them into small pieces and store it in a zip lock bag. Same goes for cilantro too. Sometimes the cilantro we get in Indian stores can hoard a lot of sand. So I trim off the root ends and discard the very ripe yellowish leaves. Then I separate the leaves from the stalks and use the stalks for the broth after cleaning it well. So I have all the ingredients ready by Saturday evening and start the process for the broth on Sunday morning. The other advantage of doing this on the weekends is cheap electricity rates, because where I live we have a scale of different rates according to the time of the day. Weekends, statutory holidays and late nights gets the lowest rate. So I tend to do a lot of baking and a lengthy cooking process like preparing broth on weekends. If you start with organic vegetables or locally grown fresh vegetables, the flavor is going to be even better. I tried it once with fresh veggies from the local farmers’ market and the the flavor was amazing. I came across a wonderful idea to freeze the broth in muffin tins. 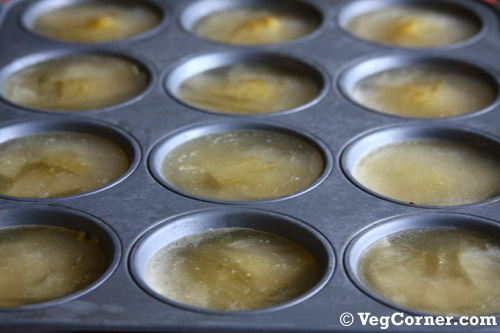 Lightly grease each muffin tin with non stick cooking spray and then fill it with the broth and put it in the freezer. After about three hours, remove the tin from the freezer, turn it upside down and run it under warm tap water and the frozen broth will loosen and you will be able to take it out. Store it in a freezer bag in the freezer for about 3 months. 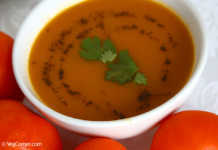 Madhu, possibly a stupid question – can we make the broth in a pressure cooker? I too used a pressure cooker but did not pressure cook it though. I guess it will make the vegetables mushy. Thanks for commenting on my diya’s. Yes i did use the Kids Play Dough. But When you are doing with the play dough, you need to make it thick and dry for a long time. Else it will crack. That’s the only thing u need to take care of. Good article..Lot of research has gone into it. Really very useful. Wow what a useful post, bookmarked it.